The Estrela Mountain Dog originates from Portugal and is said to be amongst the oldest dogs breeds there and known to be a rare in North America.This breed was used herding cattle, since it was sturdy, strong, and swift. It also was given the task of guarding, due to its alertness, intelligence and reliability. This Mastiff kind of breed, is loving and faithful by nature though, it posses an independent streak, they form a deep bond with their family and don't adjust too well to new owners.Known to be wary of strange people, they are alert and swift in the guarding of their masters, they know how to let outsiders know not to trespass. Yet they make superb companions due to their loving nature, especially with children and other pets they have been with, since their puppy hood. 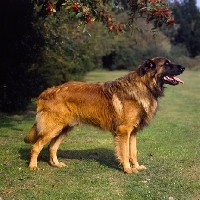 The Estrela Mountain Dog is generally a breed that maintains a good health it is not prone to many dog disease, apart from its gastro conditions and hip dysplasia. It needs to be brushed and groomed regularly, especially when shedding its coat and should be given baths when required.